NEW! Our first all acrylic compact size jersey display case! No wood frame, no worries. 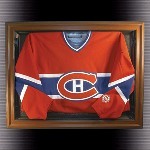 This case is simple to hang & takes 35% less space than our traditional cabinet style jersey display case. Includes 1 free nameplate. If no nameplate is wanted, simply leave that field blank. Hand made solid furniture grade beech hardwood display case cabinet of beautiful design and construction. hinges and door latches and includes mounting hardware to hang the case vertically or horizontally. Hand made solid furniture grade hardwood jersey display case cabinet of beautiful design and construction. and a matching hardwood hanger for a jersey or uniform. The hanging and mounting hardware allows for hanging the case vertically or horizontally. NOW AVAILABLE IN A STANDARD OR DEEPER CABINET DEPTH. black fabric felt background to create a stunning look completed with brass hinges, door latches and locks. Baseball jersey cabinet style display case with wood frame. Available with left or right opening hinges. Price includes 1 free nameplate. If no nameplate is wanted, simply leave that field blank. Available with wood finish or black frame. Full size football jersey display case. Price includes 1 free nameplate. If no nameplate is wanted, simply leave that field blank. Available with a wood finish or black frame. Introducing the NEW Snap-On Jersey!! Look like a professional framer with the E-Z Jersey Snap Shut Display System. This jersey case is simple to hang and takes up 35% less wall space. 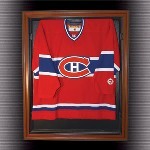 After the jersey is in place using the clear acrylic jersey hanging system, snap on the framed face with its four magnets and your masterpiece will be complete. Patent Pending. Available in brown, black or mahogany. Measures 34 ½”L X 2 ¼”D X 28”H. Jersey not included. NEW! 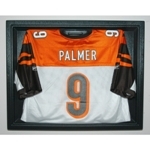 Full size jersey display case with removable acrylic face and simulated wood framed case. The newest technology in jersey display cases. Frame available in Brown, Mahogany and Black. Measures 42"H X 34 1/4"W X 3"D. Jersey not included.